Recently I have been convicted to really start evaluating my life, relationships, and my heart. You know, like the bigger picture of of life and if I am fulfilling the purpose that I was created for. The the sort of stuff that keeps a person up at night. One area specifically that I have felt called to make some improvements in is my ability to be truthful. I have never considered myself to be a liar but I recently realized that I lie to myself all the time. A few days ago I came upon this verse, “The heart is more deceitful than all else and is desperately sick” Jeremiah 17:9 , and it literally jumped off the page at me. Do you ever have those moments? I felt like this verse was shouting out at me to wake up and take a deeper look into my heart. So without any further ado, welcome to my heart. It is not always pretty, but everyday I am working on areas that I know I need to grow in. Here are just a few of the biggest lies I tell myself. If I told the truth all the time people would think I was rude. White lies. We have all told them. In the big picture of life I like to think that these “little” lies are no big deal. I mean does it really matter if I told my husband I was going to do something he asked only to know in my heart that I was not 100% committed to doing it when I said I would. If I answered him with a no or just flat out ignored him that would be rude. Or what about when a friend asks for my opinion but instead of telling them what they need to hear I tell them what they want to hear. Instead of owning up to the truth that white lies are significant I opt to be selfish and look out for myself caring more about my time or how others perceive me. If my actions do not speak louder than my words I am breeding distrust in these relationships and not being a shining light for Jesus. God does not want us to be deceptive and God himself will not lie, Titus 1:2. Satan, who is referred to by Jesus as “a liar and the father of lies” John 8:44, loves to tell us that these white lies are not harmful or significant. 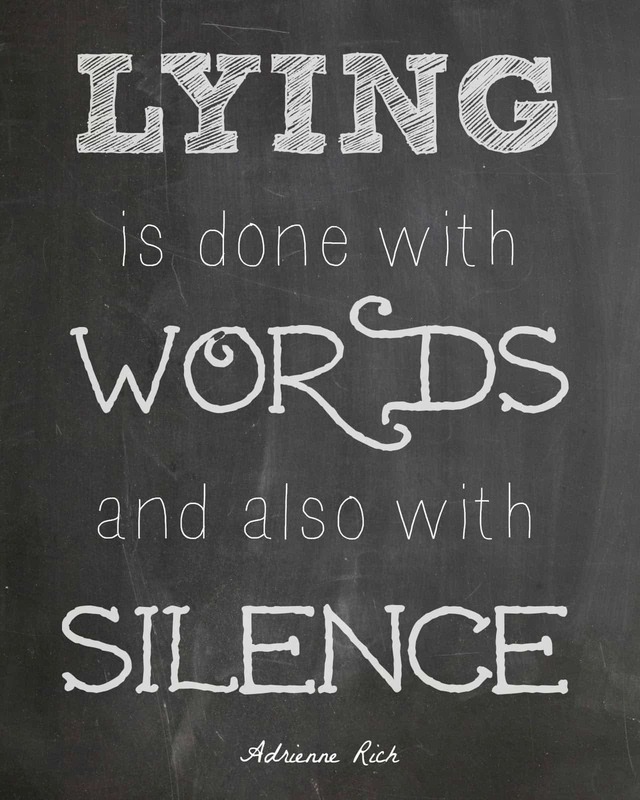 As much as we would love this form of lying to be ok we need to stop making excuses for our lying and find creative ways to speak the truth in love. Living out my beliefs is enough, I don’t need to be actively telling people about Jesus. Paul called us Christ’s ambassadors in 2 Corinthians 5:20 and in 1 Corinthians 12, Paul talks about how every member of the body of faith is to play a role and every role is important. I don’t know about anyone else but often times my conversations with friends and even strangers lead into the perfect opportunity to share about what God has done in my life. More times than I care to admit I make up an excuse of why it is not the right time to bring Jesus into the conversation. Stop being concerned about what others think, and focus on what Jesus thinks. Stop saying I don’t have time to share the gospel, and remember who has given me this time. I can love people at my convenience. The bible says that I need to love people, even difficult people, even people who hate me, and in addition to loving them I need to pray for them, Luke 6:27-36. You know the verse. “Do unto others what you would have done unto you“. Probably one of the best known verses out of the entire bible even to non-believers. I can even remember The Golden Rule being in my lifeguarding manual as a reminder of how to treat patrons when they came to the pool. It is easy to be polite and friendly to people who you don’t know. The challenge is when you make a choice to love those who have caused hurt and heartache. Loving people needs to be an all the time occurrence. As nice as it would be to love people at my own convenience it is not what God wants from me. This heart shifting change needs to start in my own heart. Jesus said it best to his disciples in John 16:33 “In this world you will have trouble. But take heart! I have overcome the world.” As believers we have the assurances of knowing that the troubles in this life precede our victory in Christ. Thank you for letting me share my heart with you. I would love to hear from you. Do you find yourself in similar internal struggles? PS…The chalkboard image was a quick creation that I made this morning. I love this quote by Adrienne Rich and couldn’t find it in a pre-made image that I liked and used picmonkey to make my own. Feel free to use it on your own blog or website, I just ask that you link back to me and this post. Tamara, while I was raised Catholic I never found any personal comfort in religion. I respect your beliefs, just like I expect the same for me. The other day I was having a convo w/ my boyfriend about Ramadan (one of my clients is from the Middle East) and the sunrise to sunset fasting. He said, it’s so unhealthy, but I really believe he was not being truthful. It probably had nothing to do w/ the fasting, but more his lack of understanding of their religion. I told him I’m not about to judge other people just like I don’t expect people to judge my beliefs. While I do not practice formal religion, I am very very spiritual in my own way, and feel so close to my spiritual world when I’m outside in nature. This time of year is tough bc it’s so hot. Anyway, I highly recommend people read THE FOUR AGREEMENTS…probably the closest thing to my bible! Thanks for reading Karen! I love being outside in nature too. It is so beautiful and I always feel so at peace…well, except when it is 120 degrees out. Then I just want to be inside in the air conditioning. The Ramadan conversation is interesting, it is so easy to be judgmental. I may not share your beliefs and you may not share mine but we can still love each other and have a well thought out and educated conversation. Thanks for your comment and thanks for reading! Friend, what a wonderful post…and something I think we all need to work on. As I read this I felt like my heart too could have written it as well. Thank you for your message, and know that I am over here working on myself for the Lord too. Since becoming a mother over five years ago my eyes have truly been open and reminded how grately I need God and who God wants me to be. I think you are wonderful Tamara and I so enjoyed this. Thanks sweet girl! Can’t wait to spend time with you soon! Love you! I really appreciate what you shared.I too struggle with telling the truth and saying what the other person wants to hear.I’ve been pondering how to be truthful and encouraging without coming across as being rude. It’s hard to find the balance! I am enjoying your posts and as soon as my broken kneecap heals,I hope to get back to my exercise routine.It’s going to be slow at first but I am determined to get back into shape! Thanks for your posts!I’m enjoying them a lot. Thank you Christine :). Hope your kneecap heals soon. Wow that sound very painful! A transparent and beautiful post. I love watching God continue to shape you as you expose a teachable heart into His hands. Motherhood opens up a season where God grows us as we are raising the little ones he has placed in our care. I love the verse James 5:12 “let your yes be yes and your no be no.” and “Speak the truth in love.” Ephesians 4:15. Motherhood opens up a season where God grows us as we raise the little ones he has placed in our care. You will find as you depend on Him that you are invited into situations where you can’t help but speak of Him. It is the overflow of the heart that the mouth speaks 1 Thess 3:12. I just wanted to say I love you and am very proud of you. That quote is powerful. Wow. What a wonderful post as well! Somethings you touched on that I most certainly could use a little internal evaluation of. Thank you for sharing this, it will be something to mull over this week a bit. Thank you so much Susan! I agree that quote is powerful! I just read 1 Corinthians 12 this morning, and definitely needed the reminder. I can totally relate to the loving others.. That was a hard one for me.. I would just say, “I can love this person, but I don’t have to like him”.. But that’s a cop out really.. I struggle with it occasionally, but not nearly as often as before..
Ren recently posted…3. Me and my big mouth..
Wow, you went there, Tamara! I cosign on all three areas where truth has become dusty. It’s tough to call ourselves liars, but telling ourselves the truth does start us on a journey of liberation and of representing God more honestly. My name means “Teller of Truth,” so I know God is really looking for me to live up to that name daily. Thanks for the kick in the pants! Alison Hector recently posted…Old School Blogging – Five Fabulous Fives!